Scientists are working to find alternative sources of energy and are coming up with more efficient energy methods. We need to save up our resources for the future generations so that they don’t find themselves in a state of crisis. Today, more than 780 million people are dependent on kerosene to light their homes. However, there is a price to pay; it’s hazardous, toxic and expensive. Also, it’s a classic fire starter and that is not entirely safe when used in wooden huts of rural areas. In 2008, two product-designers from London, Martin Riddiford and Jim Reeves, took it upon themselves to come up with a cheap and alternative method for lighting up homes. Now that we have covered blade-less turbines and such green energy methods, this one is more concerned with simple physics rather than new technology. Well, the idea is simple but of-course the execution requires technology! 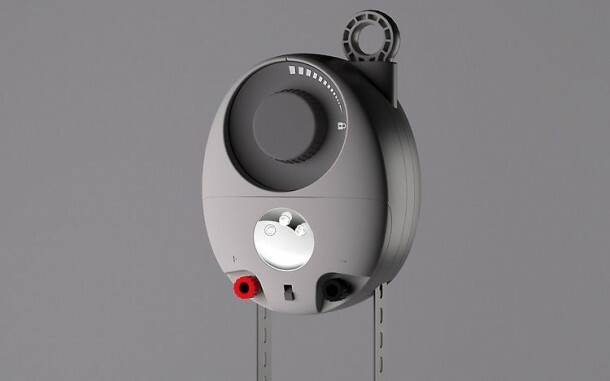 The basic idea was derived from Riddiford knowing that a falling weight has enough energy to power a grandfather clock and he applied the same principle to power a light bulb. His first attempt- A successful one- he made use of the crank of a wind-up light to a cycle wheel and hanged the weight from the wheel to make it spin. The spinning of wheel lighted up the device. The next four years were spent by Reeves and Riddiford along with their small team to refine their design of ‘Gravity Light’. 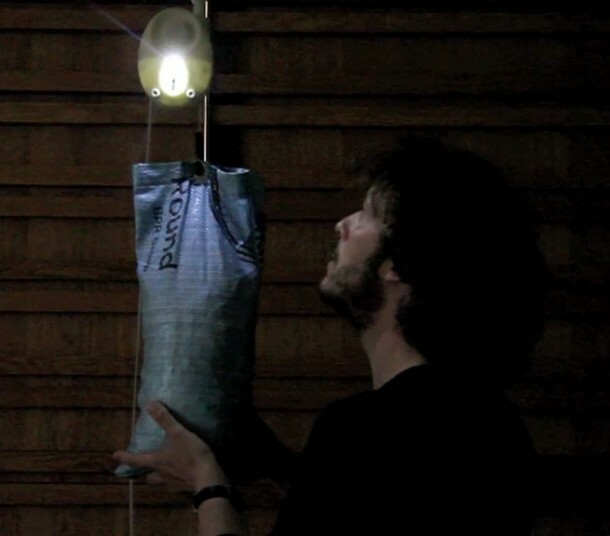 The principle involved is the same as used by Riddiford before; user hangs the gadget and fills the fabric bag that is attached to the device with almost 28 pounds of material. 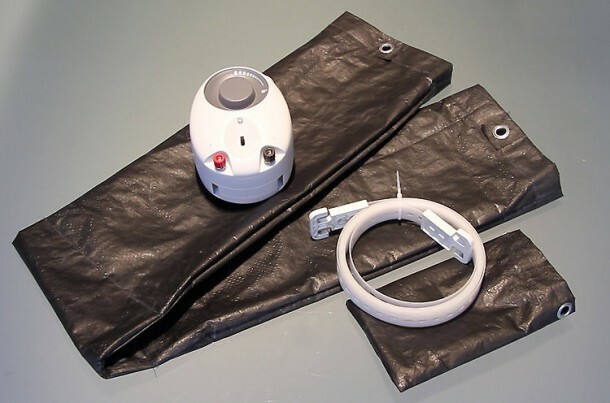 The lifting and releasing of this bag steadily results in the pulling of a notched belt through the gadget’s plastic hub. This in turn results in the spinning of gears, well a series of them actually, and it drives a motor which continuously powers for thirty minutes, a LED light. The team has manufactured a thousand Gravity Lights and has planned to send them to different countries from the perspective of testing and using the results to further refine their invention. ‘It’s exciting to witness so much positive reaction to what we’re doing. Besides remote villages, the lamp could prove handy in campsites, closets, and any dark nook far from a socket.’ Riddiford says. The inventors are hoping to get a license for a retail version of gadget that would cost $10. The idea is brilliant considering that this system doesn’t require energy to work and is not using up any of our resources. Rather it’s a safe method and you are not even polluting the environment. Such systems and researches need to be appreciated and funded so that the scientists receive the encouragement that they deserve and keep them motivated. Also, such researches should be publicized on media to promote interest among common people regarding science. In another feat, Researchers at IBM decided to gain public interest for science by making world’s smallest film. All in all, this Gravity Light is a wonderful invention. Watch the video and let us know your comments! Thank you very much for your invention and technology. Our country is very poor the electricity and other energies. Most of the people need the electricity, but the government could not supply for the people. Our government is trying to develop to our country at present. So, we need it and please you may try to sell to our country. I am resident of Kenya. I would like manufacturer to contact me back. I am interested in this product and I would like to promote it in Kenya and neighboring countries. I would like to see this with more emphasis on the clock work inspired drive. If a Grandfather clock can run for days on end on one wind, why can’t this”? is any one hv practical for tht how can an object be invisible…??? Simple, Effective ,Useful , No recurring resourse Excellent , Good job . Your device you can add a provison to charge Mobile phone / also TABS or any small devices etc ., in the Day time , Mobile phone are there all parts of the world , plus power cuts people can charge using this , Govrnment can keep it in public places like Bus stations etc to charge mobile , instead using other resources .Good luck., Also as far as possible you can use recyclable material for Covers etc could be benficial to environment . With all the energy crisis going on in this country, we need such new technology. isagani – which country are you from?